When it comes to fine Tequila, care and tradition are considered to be of paramount importance because Mexican’s see it as a gift from the gods. Carlos Camarena passionately carries on the family business his grandfather established back in the 1930’s. Not only has he launched Tequilas that have gained mythological status, his 100% Agave Jalisco Tequilas are a smash hit that are rapidly snapped up globally. Camarena’s partnership with Dale Sklar, a recognizable Tequila authority, they defined a new expression of Tequila-istry with their approach to making it that has dominated top-notch competitions. Villa Lobos Extra Añejo soul comes from Agave harvested by agaveros on the Camarena Family plantations in Los Altos. This location lies amongst the celebrated Arandas Highlands, from which only the sweetest and ripest Agaves are used for fermentation and distillation. Like his grandfather Don Felipe, Carlos regularly walks amongst the family Agave fields to ensure crops produce good sugar levels required for fine Tequila. The liquid itself spends 4 years ageing in oak barrels (a lot for Tequila!) after spending at least 6 months resting in open steel tanks. Fiesta in a bottle with with lots of rich, silky quality as Carlos Camarena likes to say. 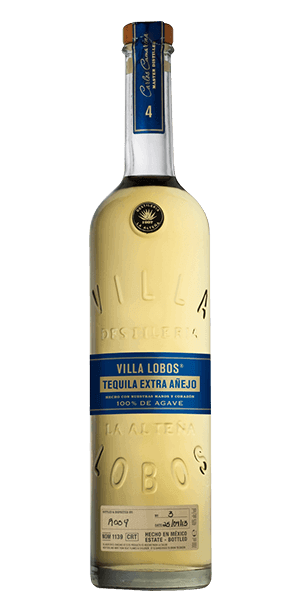 What does Villa Lobos Extra Añejo taste like? The Flavor Spiral™ shows the most common flavors that you'll taste in Villa Lobos Extra Añejo and gives you a chance to have a taste of it before actually tasting it. Slightly smoky with some floral notes, a bit of citrus and a hint of vanilla. Sweetness of caramel married with the lightness of spices. A long, sweet and spicy aftertaste. Sweet, spicy notes, sweet vanilla, agave, caramel, smoky, floral, citrus, fruit. It is an outstanding, rich, 4 Year Old Añejo Tequila with a rich birth; while a sweet & silky life leads to a long & balanced death. Smooth sipping Tequila, excellent value for money!